Our 2003 brush bandit 200xp disc style chipper is a slow feed unit able to chip branches up to 14 inch in diameter . We do turn all chips into a recyclable product used as mulch in gardens and around trees. We do offer chipping at a hourly rate, please call for more details. 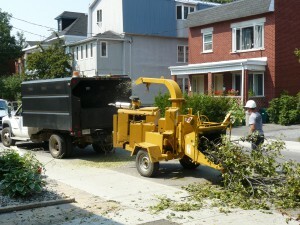 We also have a asplund drum chipper capable of chipping branches 12 inch in diameter.